I have two trips planned before Christmas: Lucerne for a week and then Cologne for just a few days. That does not leave a lot of time to help with getting the dinner ready for the main day, so I guess Christmas will be spent in the doghouse. In Lucerne, I’ll be exploring. Cologne is more of a social visit so the Christmas markets will get a battering — along with copious amounts of glühwein and bratwurst. If in Europe, meeting friends for laughs and drinks on a cold evening at a small town Christmas market. But if anything goes, then careering down a piste on two planks of carbon fibre with a group of friends followed closely by plenty of après-ski. This year as I’ll be home, I’ll be spending time online, though a little quieter on Christmas day. My closest circle of friends will receive a card, handed to them personally at sometime over the festive period when we meet. As for those that I have gotten to know online, hmmm…anybody know a good online card site? I would need some news to produce a newsletter. During my travels, I’ll be staying at a veggie house so most definitely looking forward to the turkey although I’ll have to go out for it myself, a day or so before the big day. I’ve always loved The Worst Journey in the World by Apsley Cherry-Garrard, about Scott’s final Antarctic expedition (Cherry-Garrard was the youngest member of Scott’s team and one of three men to survive the notorious Winter Journey). Any of the mountaineering books by Joe Simpson is worth reading. These days I don’t have that much time to read but when I do, I prefer mountain or exploration literature. I’m looking forward to finding some time to read The Mammoth Book of Adventures on the Edge, by Jon E. Lewis — a collection of 28 eyewitness accounts of climbing adventures on the world’s greatest mountains. Mount Everest or maybe Mount Erebus (in Antarctica) for skiing. And I really have to bring in the New Year in Sydney one day. What famous person or persons do you think it would be fun to spend New Year’s Eve with? Billy Connolly or Peter Kay would be the funniest people to party with over New Year; David Attenborough and Ranulph Fiennes would provide the most fascinating stories. I like to think that it is possible to adapt to most cultures and environments and therefore fit in well, but if I had to pick anywhere, it is hard not to feel a little alien in India. Every day seems to throw up a new surprise that often can be quite shocking. Any time when I’m surrounded by friends, it doesn’t matter where I am. The feeling is one of belonging and being completely at home. Excited; the New Year always offers new opportunities and the potential to be an amazing year. 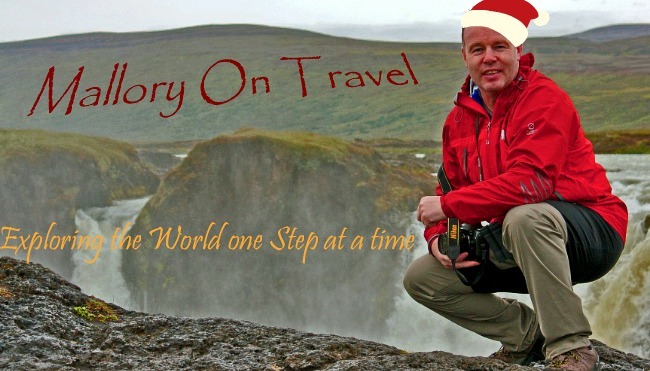 STAY TUNED for Monday’s featured nomad (8/12) in our 12 Nomads of Christmas series. I have to agree – Peter Kay, what a bloke to spend a New Year with! Well, unless his nan was there too. As for New Year in Sydney… well, I’ll warn you to take 2 big bottles with ya – one to drink from (water in) and one to… well, y’know (water out). The crowds are pretty intense anywhere the bridge fireworks are visible from, and a good bit of the sound gets drowned out by ambulance sirens… don’t be in one of ’em! Ah, Peter Kay… The cause of one of my most displaced moments. Despite the fact that I spent my early childhood in the Manchester area, when my sister introduced me to a Peter Kay DVD for the first time, about four years ago, I was bewildered and not a little horrified to discover I only understood about 1/3 of what he said. That’s what 15 years on the other side of the Pond will do, evidently.